Dr. Cleary has won tremendous respect of the people of New Brunswick, who hold her in high standing for her honesty, forthrightness and integrity. Dr. Cleary’s award-winning 2012 report on the health impacts of shale gas development was balanced and unbiased, her conclusions based on careful research and science. As a result of this, and her subsequent actions, she is held in high esteem among the citizenry, who appreciate her outspokenness in contrast to the undemocratic actions of the previous government, which attempted to hold back the report’s release. The enthusiastic response from her colleagues, the requests to have her speak on the subject – nationally and internationally – are evidence of the esteem she garnered in her field. She was awarded the Queens Diamond Jubilee Medal in 2013 ( nominated by Lt.Gov. Graydon Nicholas) for her services to the people of Canada and earlier this summer honoured with the Dr. Donald Morgan Service Award from the New Brunswick Medical Society. The award recognizes and celebrates the contribution made in education, research, health promotion or humanitarian service. And just weeks before her forced leave of absence, she was further recognized with a Paul Harris Fellowship by the Rotary Clubs of Fredericton for her positive impact. 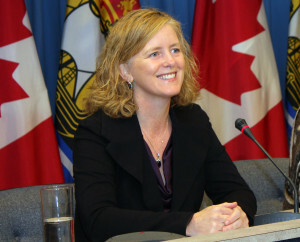 Dr. Cleary’s selfless and courageous travel to Africa during the Ebola crisis cast a warm light on all of New Brunswick; we were touched by her compassion and proud that ‘our’ CMHO was on the front lines helping others. Dr. Cleary’s demonstrated professionalism has elevated the entire office of the CHMO, and the hard work that is accomplished under her leadership has earned wide-spread respect. When public health is impacted, this is a department that needs autonomy and a strong voice that people trust. We were relieved that public health impacts were mentioned in the premier’s five conditions for lifting the moratorium and that she provided input during the recent interviews conducted by the Hydraulic Fracturing Commission. That people now fear her forced leave of absence is a pre-emptive strike – one that serves multiple interests – is clear evidence of the deep and growing distrust citizens have in the political processes of successive governments that have favoured industry needs above those of the populace. When public health and environmental protection are given precedence, it impacts industry’s bottom line. This rush of support, perhaps, is the subtext of the story: The way to win the hearts and loyalty of the people of New Brunswick is with consistently demonstrated acts of courage, openness, honesty, integrity and high ethical and moral standards. It would seem evident that those in government can take a lesson from this and we hold out hope this government will rise to that challenge. But we ultimately call for this issue to be quickly concluded in-house without further delay, and Dr. Cleary be placed back in her office, again serving her patients – the people of New Brunswick. Posted in: Fracking & Health, Fracking News, Research & Scientific Studies.